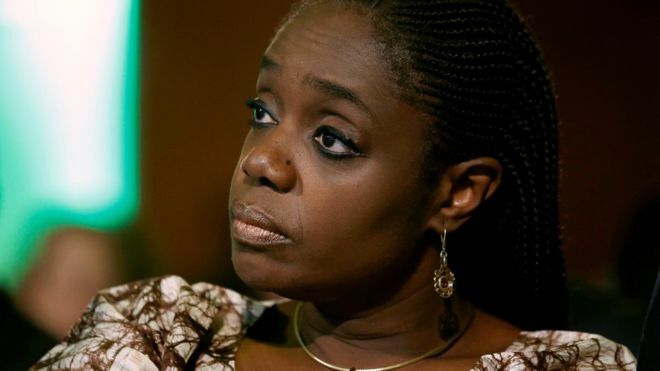 igerian Finance Minister Kemi Adeosun resigned on Friday amid allegations she presented a fake national service exemption certificate in order to qualify for public office in the West African nation. Adeosun denied any wrongdoing saying that she was informed of her exemption due to her residency and having exceeded the age of 30. The politician, who was born and spent her youth in the U.K., graduated in 1989 from the University of East London — when she would have been 22 — and received her first Nigerian passport at the age of 34. “On the basis of that advice and with guidance and assitance of those I thought were trusted assocates, NYSC were approached for documentary proof of status. I had no reason to suspect that the certificate was anything but genuine,” she said. President Muhammadu Buhari put the Ministry of Finance under the oversight of the minister of state in charge of budget and national planning, Zainab Ahmed, the presidency said in an emailed statement. The change is unlikely to have an impact on economic policies in Africa’s biggest oil producer, which is recovering from an economic slump in 2016 and holding general elections early next year, according to Malte Liewerscheidt, vice president of the risk advisory group Teneo Intelligence. “Adeosun is not a political heavy-weight and her resignation and replacement would be highly unlikely to alter Nigeria’s overall fiscal and economic policies,” he said in an emailed note. Buhari’s government hasn’t rushed to dismiss the allegations, Liewerscheidt said in the note. As finance minister, Adeosun, 51, helped lead the economy out of its worst slump in 25 years after the price of crude, its main export, fell. She also instituted a whistle-blower policy and helped push reforms to boost Nigeria’s tax collection to increase non-oil revenue as the West African nation seeks to wean itself off oil. News website Premium Times reported in July that Adeosun submitted a fake national service exemption certificate when she presented her credentials to lawmakers in 2015. The government said it was investigating the matter.